The Soul Rebels Brass Band enjoy a reputation as the most progressive outfit in the current brass band scene, composing original songs with a strong basis in hip-hop that also feature precise harmonies and intricate arrangements. The Soul Rebels began as the Young Olympia Brass Band under the tutelage of Milton Batiste (the co-director of Dejan’s Olympia Brass Band), who taught the young musicians traditional brass band repertoire and style. At the same time, the members of the Young Olympia became interested in playing funk- and hip-hop-based tunes outside rehearsals. In 1991 they opened for the Neville Brothers at Tipitina’s, a nightclub in Uptown New Orleans, where Cyril Neville suggested the band name itself after the Bob Marley song, and soon the group began to make their mark in New Orleans. When we speak of let your mind be free, first we talk about racial discrimination. Black, white, red, brown, yellow, it doesn’t matter what color you are. Because we’re all of the same Lord, and we bleed the same color. Red. “Let Your Mind Be Free” used R&B-style vocals and instrumental layers over traditional brass band instrumentation. Unlike other brass band songs, those by the Soul Rebels were often meant to be performed onstage, with the assistance of amplification, rather than only in the streets. The band’s second album No More Parades (1998, Tuff City Records)continued to showcase blends of brass band instrumentation and hip-hop studio influences. 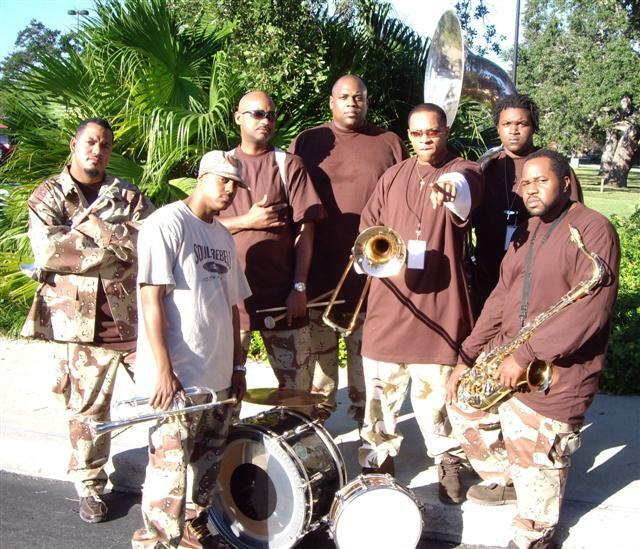 Soul Rebels also embraced the “soulja” look, often appearing in camouflage uniforms similar to those worn by local hip-hop musicians Soulja Slim and C-Murder. No More Parades was a clear statement of the band’s intention of moving away from community second line parades and toward stage-based shows, and away from all-acoustic recordings to albums heavily influenced by studio technology. This led them to their 2005 album Rebelution (Barn Burner Records), which relied heavily on R&B-style vocals, rap, drum machines, sequencers, and synthesizers rather than the group chant and acoustic instrumentation that most bands have limited themselves to. “Groove Train” showcases all of the changes embraced by Soul Rebels. The song is full of studio tracks layered over acoustic brass band instrumentation. Prevalent keyboards, percussion, and vocal lines are all better suited to studio and stage performance, but impractical for street parades. One obvious connection to the brass band tradition is the tuba, which combines with horn lines throughout the song to remind listeners that Soul Rebels are indeed a brass band. The Soul Rebels Brass Band is led by Lumar LeBlanc (snare drum) and includes Derrick Moss (bass drum), Marcus Hubbard and Julian Gosin (trumpets), Corey Peyton and Paul Robertson (trombones), Erion Williams (saxophone), and Edward Lee, Jr. (sousaphone). Former members Winston Turner (trombone) and Tannon Williams (trumpet) left to form the Brass-A-Holics in 2010. In addition to frequent festival appearances, the Soul Rebels play a weekly Thursday night show at Le Bon Temps Roule on Magazine Street in Uptown New Orleans.